For almost as long as I can remember, I have dreamt of creating a fragrance that captures the singular climate, lifestyle and aesthetics of my native Scandinavia. In 2008 I decided to realize my dream, and began studying the fine art of creating fragrances. It has been an intense and often difficult journey – and one I now understand is life-long endeavour. Like the Nordic landscapes that inspire me, the landscape of beautiful fragrances is subtle in its details, yet vast in its uncharted expanses. Exploring it is a labour of love, and I am both proud and humbled to be able to call myself Denmark’s only practicing perfumer. Perfumery is an art, and every artist has his or her own vision and approach to the medium. My vision is to create fragrances that encapsulate Scandinavia, and my approach is to fuse classic French perfumery with stringent, Nordic molecular science. Not so different from a painting or work of music, a great fragrance is a composition. It is my deepest and most sincere hope that you find these compositions of mine – inspired as they are by the Nordic spirit I treasure – a genuine delight to the senses. Oud is one the most expensive raw materials used for perfume in the world. It has a uniquely special fragrance of sweet woods and woodland soils. 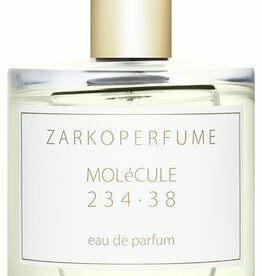 MOLéCULE 234.38 is based on one, big molecule as the dominating ingredient. The molecule interacts with ones own pheromones - in a sense making it more of a phenomenon than an actual fragrance. This perfume is composed for the self-conscious, luxurious woman, who find herself in the hustle and bustle of every day life.